A lead magnet is a free ethical bribe which offers a valuable piece of relevant information to a prospect in exchange for their email address. 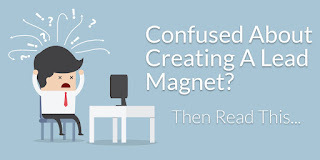 There are many types of lead magnets such as pdf reports, eBooks, guides, cheat sheets, email course, video training, software trial, and so on. The type of Lead magnet to be offered is based on niche research and customer avatar. The aim of any lead magnet is to convince visitors to provide their email address in exchange of the information. That’s why creating a high-quality lead magnet that appeals to the target market is vital. 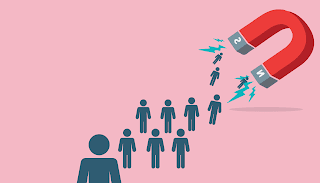 A lead magnet has a great significance in email marketing scenario because it’s the one thing that gets you the email address of your potential customer which you can use for sending promotional emails and make money. 1. Be specific - Your lead magnet should solve a specific problem, tackle a challenge and help people to achieve a specific goal. It shouldn't be too broad and vague; it should offer a specific solution to a specific target market. 2. Keep it short and simple - As your lead is going to solve a specific problem you should keep it very simple and short. Something which can be easily consumed within few minutes. 3. Deliver solution instantly - When people are providing their email in exchange your lead magnet they, want to get that solution instantly. Therefore make sure you don’t stretch delivery of your lead magnets in long parts. Give them whatever you’ve promised instantly. 4. Promise big - When you promise big people will naturally feel the urge of giving their emails because, everyone wants to achieve something big and if your lead magnet promises them to get that, they will happily give their emails to you. This lead magnet instantly appeals to the audience which whose goal is to make money via blogging, it’s also making a big promise “$30,000 per month” which instantly urges people to opt in. 5. Deliver great value - Your lead magnet is your first and the only chance to make a positive impression on your prospects. It should build your image as an authority person into your prospect's minds. Therefore make sure you’re delivering highest quality material. Don’t damage your image by delivering substandard material. Your success in email marketing is dependent on how well your opt-in page converts. Hence it’s important to come up with a highly optimized opt-in page. 1. Headline - A good opt-in page has a strong headline which directly addresses the goal, challenge or problem any target visitors has. As the headline is highly targeted, it does the job of catching visitor's attention. 2. Benefits - Once you have the attention of your visitors the next step is to give them a strong reason to subscribe. You can do this by displaying the benefits they are going to receive when they become a subscriber. Don’t forget to use the magical word “FREE” Inside benefit section such as free guide, free cheat sheet, free report and so on. 3. 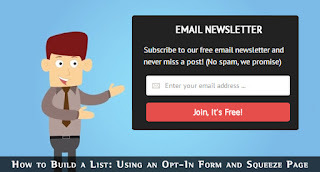 Opt in box - It’s the box where people enter their email address. Make sure your opt-in box stands out on the page. Another trick to improve conversions is to write the benefit directly on the subscribe button such as “Free access,” “Download Now,” “Watch video”instead of using common terms such as “Subscribe Me”, “Sign up” and so on. 4. Clean look - Most of the successful opt-in pages have clean looking design on them, they don’t have any unnecessary links, images or contrasting colors on them. The aim of using a clean design is to prevent the visitor from getting distracted and helping him to focus on the opt-in process. To deeply understand the concept take a look at the following opt-in page. This page is well optimized and has all the 4 components mentioned above. Now you know how an optimized opt-in page looks, it’s the time to get your hands dirty and build one for yourself. You can build an opt-in page in many ways, if you know HTML and CSS programming then you can easily one for you. But if you are like most of us who doesn’t know programming then you can use easy to use opt-in page building tools. These tools will help you to design your opt-in in whichever you want without any hassle or coding. These tools are very easy to use, and you can even create a clean looking opt-in page like the one shown in Step 1 within few minutes. Another benefit of using these tools is that they have pre-designed templates, all you need to do is choose the right one and edit it accordingly. I am mentioning few most popular opt-in page builder tools below; you can choose any one that pleases you the most. All the tools will require you to have a Wordpress site. Most of the product owners create promotional resources which are used by affiliates for promoting the product. The resources include many things such as custom landing page, banners, text links, product images, articles, keywords, email swipes and so on. To find the promotional resources visit the product website and look for a link named “Affiliates,” click on in and then look for email swipes. When you’re planning to promote the product using email marketing take the email swipes provided by the vendor, place your affiliate link and send it to your subscribers. In the case, if your product vendor doesn’t provide any email swipes you’ll have to write your own product promotional emails. Write at least 5 emails and send them to your subscribers once every day. Study what the product is about, its benefits, its features, and other important aspects and create promotional emails based on that. An autoresponder is a software system which allows you to automate email collection and sending process. Once configured an autoresponder will automatically add subscriber’s email to your email list and send them pre-defined emails at the given time and date. Autoresponder makes the life of an email marketer a lot easier, and it’s an essential tool he can ever have. I’ll personally recommend you to choose Getresponse because it’s easy to use, they don’t charge you any fee for the first month and also allow you to use their full features. So head over to Getresponse.com and sign up to create your free account. For the purpose of this guide, I am going to teach you how to configure Getresponse. When people subscribe to your email list, they’ll first expect to receive their lead magnet. Hence you need to configure your autoresponder in a way such that it will deliver the download link of your lead magnet into subscriber’s email within minutes of their subscription. Before we you can start configuring your autoresponder, I’ll recommend you to upload your lead magnet to your Wordpress website and get the download link. To upload the lead magnet to your site just log in to the backend of your WordPress site, select Media > Add New option from the Wordpress menu on the left. Upload the file, once the upload is complete click on the Edit button the right and save the File URL which is located on the right-hand corner into your notepad. Once you have the File URL you can send it to your subscribers via email once they opt in. ​1. Once you’ve created a GetResponse account, log in to it. Click on the drop down arrow button in the top right corner and click “Create Campaign.” Now, give a name to the campaign and create it. 2. Go to your dashboard and click on the drop down arrow button in the top right corner and click “Campaigns List." 3. Now, you’ll see the list the campaigns on you account. Go to the “Actions” drop-down menu beside the campaign you just created and click “Make it default." 5. At this point you’ll see numbers, they represent the day on which you want to send an email after they’ve subscribed. As you want to send your lead magnet immediately to your subscribers, click on day 0. Click on “Create new mail,” follow next instructions and paste your welcome email and include the File URL of the lead magnet which you uploaded previously on your Wordpress website. Once completed click on the “Save and publish”button, your email will be sent immediately as soon as somebody subscribes to your email list. This is very easy just go to “Manage Autoresponder” and select the day on which you want to send the follow-up emails, paste the emails which you’ve created in Part 3 and paste them one by one each on every single day. For the purpose of this guide, I am going to teach you how to connect Getresponse with an opt-in page built using Thrive Landing Pages. If you are going to use thrive landing pages make sure you are using given templates for creating your opt-in page, default templates already contain necessary components hence your job will become very easy. To get step by step details for connecting your opt-in page to your Getresponse visit the following URL and watch the video. A thank you page is a regular webpage where a visitor lands when he subscribes to your email list. A thank you page should guide the subscriber to take the next action. Such as asking them to click on the confirmation link. Once your thank you page is ready, you can connect it with the Thrive Landing Pages so that your subscribers will be appropriately redirected when they opt-in. To add thank you page to Thrive Landing Page, click on the opt-in box in the edit mode, select “Connect with Service” option. Scroll down and paste your thank you page URL in Action After Signup section. Once you have connected the opt-in page and autoresponder, your system is almost ready for making you money. Now all you need to do is bring in traffic and see your email marketing system bringing cash to your bank account on autopilot. In this guide we’re going to look at both the methods, you can select and work on the method you like. For now, let’s look into free methods first. Email marketing is highly suitable for people who want to get quick returns on their investment. Once your system is ready, it will make you money until you stop the traffic. It’s one of a great way of earning passive income online. Once you have a working email marketing system, you can always optimize it by promoting new high-end products. You’ll also need to test various headlines, email texts, link placement to boost your email open rates. But all these come after you’ve set a basic system and have seen success with it. id methods especially the solo ad one because it’s very easy to bring traffic through it and it provides a quick return on investment. To become super successful in email marketing you’ll have to be the master of all above-mentioned pillars, and you can only do that practicing. You might not get everything right on the first attempt, but if you consistently try to improvise and take efforts in the direction, then nobody can stop you. So go ahead and give it your best shot.